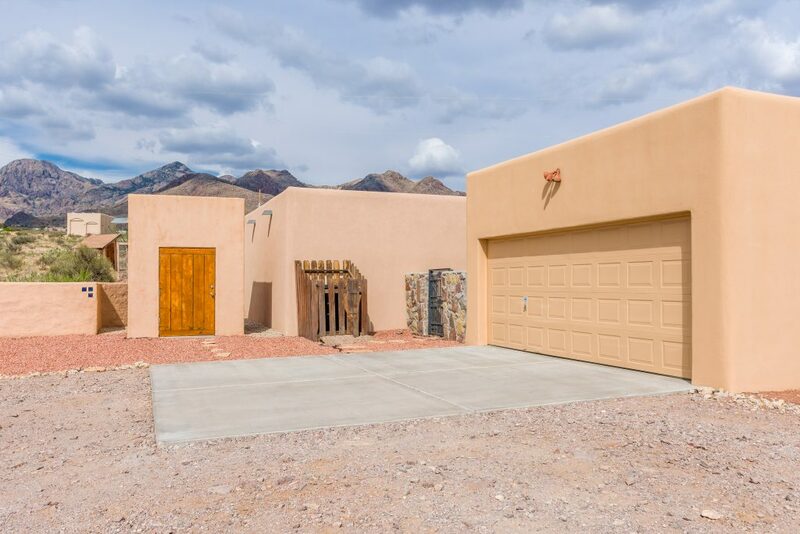 Experience the ultimate Southwestern lifestyle in this lovely rammed earth solar home at 5075 Copper Bar Road, nestled at the feet of the Organ Mountains! Rammed earth construction with 18” walls offers unsurpassed energy efficiency, sound attenuation, & low-maintenance durability. Powered by 16 solar panels, electric bills have returned over $500 to the owners in the last 16 months. With 3 bdrms, 2 baths, large office/study, viewing deck & 30’ x 30’ detached game/hobby/music room, this home has space for all your needs! Open floor plan features a great room with a dramatic kiva fireplace, authentic vigas in the ceiling & incredible mountain views. The fabulous kitchen features an island with pendant lighting, huge walk-in pantry, custom cabinets, built-in hutch & Talavera tile backsplash. Enjoy the serene master suite with a door to the patio, huge walk-in closet, jetted tub, snail shower, double sinks, and stunning Talavera tile accents. This home has so many features: tile floors, high-end casement windows & solid wood doors throughout, built-in sound system, reverse osmosis, water softener, and much more! A silicon reflective roof coating was added last year to the house & accessory building (with a warranty), adding to the energy efficiency and durability of the home. Rammed earth construction, with 18” thick walls provides a large thermal mass and unsurpassed energy efficiency, amazing sound attenuation and deeply inset doors and windows. Rammed earth does not rot and insects cannot eat it or get through it! This home is located in the Soledad Canyon area, noted for its large lots and amazing views. Get up close and personal with the iconic Organ Mountains, and also enjoy panoramic views of the entire City and valley – it is truly breathtaking!